1. Reach potential customers – Expand your audience by taking your show, business or message on the road. Bring your message into communities, schools, and other locations to give your brand more exposure. 2. Create an experience – Expand your business vision to include a mobile marketing experience that immerses your customers – on their turf – in your brand and offers an opportunity for immediate feedback. 3. Create awareness – Imagine your brand or message wrapped around your trailer’s exterior for all to see as you cruise down the highway or participate in special events. 4. Unlimited possibilities – A specialty mobile unit gives you the freedom to take your marketing on the road. Showcase new products, give presentations, seek support for a cause or provide hands-on education – all in a vehicle customized for your organization’s needs. 5. Functionality – With a mobile marketing vehicle, you are in control of when and where you showcase your brand. With a Triune-built sustainable trailer, you can keep your brand updated through the years with our many customizations that implement the latest technology. 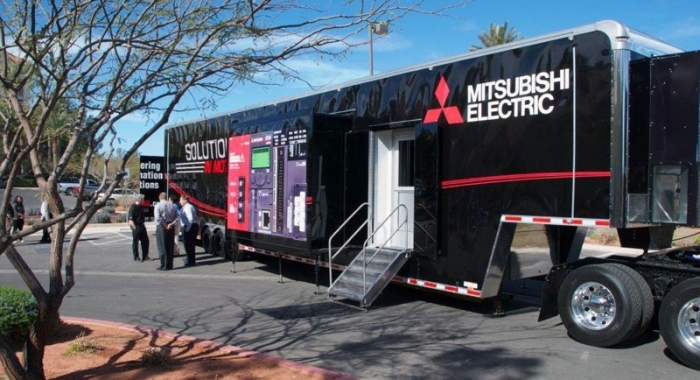 A mobile marketing vehicle can be your state-of-the-art solution to your marketing display needs beyond brick and mortar locations and the Internet. Give your business a mobile boost with Triune’s innovative and customized mobile trailer solutions.